4Videosoft Mac iPod Manager Platinum is the comprehensive iPod to Mac and Mac to iPod transfer software, which can freely transfer iPod file, video, audio, photos, etc. to Mac for backup and transfer file to iPod from Mac. With it, you can also transfer TV shows, podcast, iTunes U, ePub, PDF, audio books, SMS, and contacts between iPod and Mac. It is compatible with all Apple devices, like iPod, iPad, iPad 2, iPhone, iPhone 4, iPhone 4S, ect. Transfer iPod files to Mac, iPod to iTunes, transfer files/folder Mac to iPod. ...... And the Mac iPod transfer highly supports iOS 5.0.1 and iTunes 10.5.1. 4Videosoft iPod Manager for Mac success to transfer any iPod file to Mac, to iTunes directly for backup. This Mac iPod transfer can help you transfer and import local file to iPod freely without missing. When connect various Apple devices to Mac, this Mac iPod transfer software can help you transfer files among these devices directly. This software highly supports all Apple devices. with this iPod Manager for Mac, you can backup iPhone SMS and contacts to Mac. The iPod transfer for Mac users assist you to convert any popular video and audio file to the video and audio formats supported by your Apple player. It is easy for you to edit the video to get the perfect output effect you want. Qweas is providing links to 4Videosoft Mac iPod Manager Platinum 5.0.12 as a courtesy, and makes no representations regarding 4Videosoft Mac iPod Manager Platinum or any other applications or any information related thereto. Any questions, complaints or claims regarding this application 4Videosoft Mac iPod Manager Platinum 5.0.12 must be directed to the appropriate software vendor. 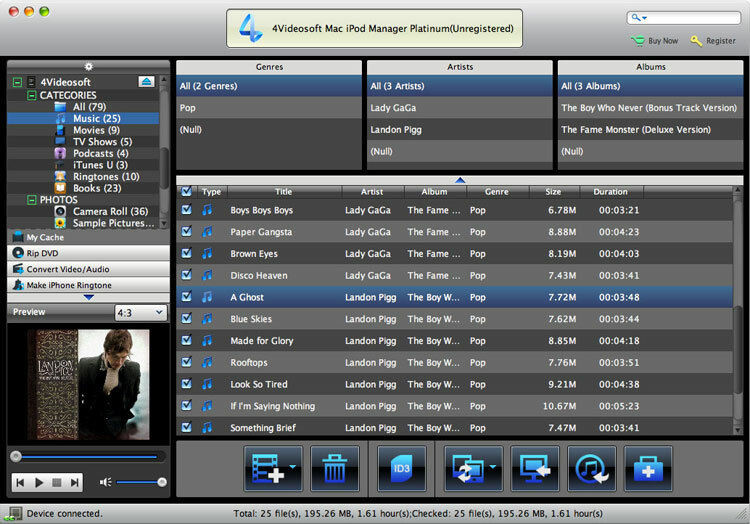 You may click the publisher link of 4Videosoft Mac iPod Manager Platinum on the top of this page to get more details about the vendor.